So, when are your cosmetic products ready for the makeup mortuary ? If cosmetics are not disposed of in a timely fashion, they risk gathering bacteria or changing composition which can affect the product’s efficacy and more importantly could pose a health risk. Here are some parameters as to when it's time to say Bye Bye Beauty! 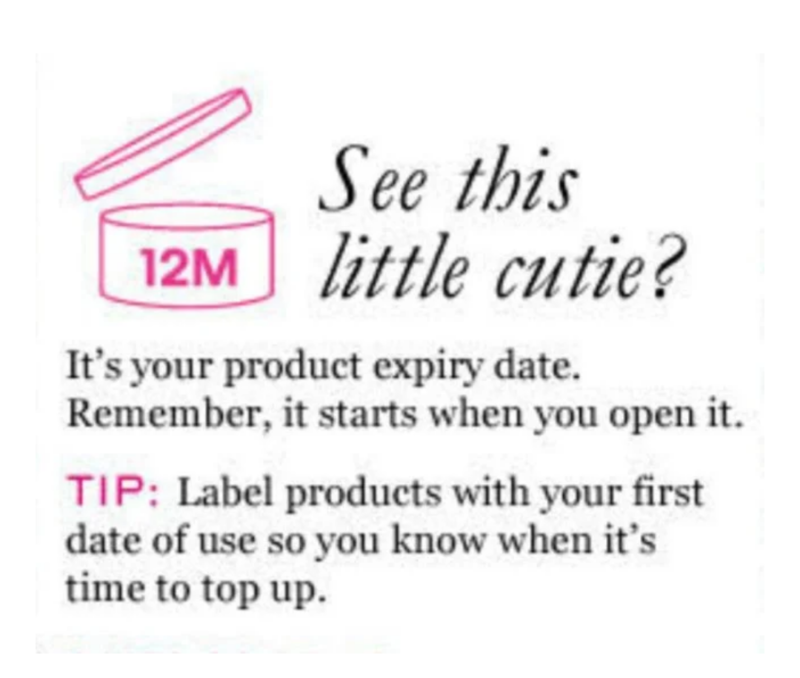 Many people are unaware, but a vast majority of makeup products actually have a suggested expiry date based on product production dates and recommended time-of-use after opening. This is usually indicated right on the packaging itself. This standard marking is often small and easy to miss. 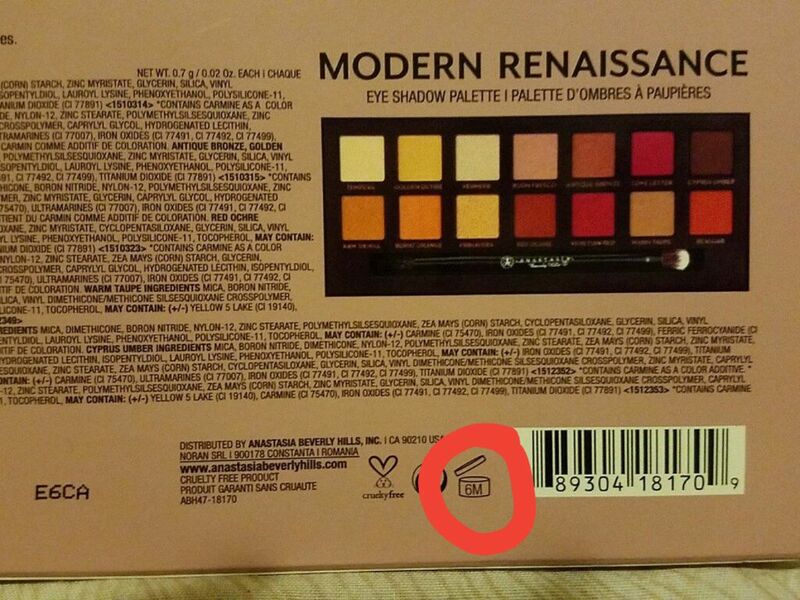 It usually can be found on the back paper label on many palettes or on the side or bottom of paper boxes of mascaras, lipsticks and eyeliners. The expiry symbol called a PAO (period after opening) looks like a small jar of cosmetic with a flipped open cap and a digit followed by "M" written in the middle. ( e.g. : 3M, 6M, 12M, 24M). The digit will indicate how many months it is suggested that you continue to use this product after it is first opened due to risks related to oxidization as well as microbiological and chemical changes. A good trick that keeps me on track is that I label most of my products with miniature stickers on which I jot down the date that I opened them. Different opinions are documented as to the shelf life of liquid eyeliner. Some say they should be kept 2 to 3 months, others say 6 to 12. In my opinion, it really all depends on how well you clean your liner brush between each use. Remember to always be wary for changes in product composition and smell. When in doubt throw it out! Liquids such as liner and mascara that come in close contact with the eyes are something you should never take chances with! I personally never use mascaras past the 6-month point and have been known to mostly toss them between the advised 2 to 3 month mark. Better than risking an eye infection or even worse! With mascara remember to never pump the mascara as it allows for the introduction of air into your mascara tube. Also never add water to mascara to dilute it. I have read on the internet that it is not uncommon for people to even use saliva for this purpose! Eww! Yes no lie! I nearly gagged! Only use a bit of saline solution if you need to dilute your mascara or place the tube in warm water to try to bring a mascara back to life that is under the three mark shelf life. Mascara is one of the most dangerous breeding grounds for bacteria when it comes to makeup and I am most careful with it. Be vigilant if the mascara begins to clump up or has any odor. If you are in doubt get rid of it immediately! Some people even go as far as to use disposable wands so that each mascara application is as hygienic as possible. When it comes to mascara I don't find this excessive. Any precautionary measure one can come up with is good practice. Pencil eyeliners usually last safely for 1 to 2 years. I always become wary of pencil eyeliner (including eyebrow pencils and lip liners) if they begin to lose their creamy consistency. If I notice that my pencil liners become dry and the tip breaks off soon after I sharpen it, this is usually the point where we part ways! Remember that regular and frequent sharpening also helps to keep your pencils clean and combats the accumulation of bacteria! Liquid concealers remain good for a year. Like most liquid makeup, its expiry time is shortened due to it having a water base which can breed bacteria. These items last better if stored in a cool dry place free from direct sunlight. Powder concealer, like most powders last longer, up to 2 years. Liquid foundation has a shelf life of 6 to 12 months while powder foundations last anywhere from 18 months to 2 years. Face powders usually can last up to 2 years. Cream eyeshadow can last from 3 to 6 months or 12 to 18 months depending on how creamy and wet the formula consistency is. Powder Shadow, due to not having a water base, can last up to 2 years. Powder shadows need to be discarded if they become flaky or hard pan. Remember, it is important to routinely clean your makeup brushes if you want to maximize the shelf life of your products. Cream blush can last up to 1 year while powders are good for up to 2 years. Lip gloss generally lasts from 12 to 18 months. You should discard a gloss if it becomes very sticky or begins to smell. I always routinely clean the tip of my lip gloss brushes, sponge or doe foot applicators with a tissue after each use before setting them back into the tube. This ensures my glosses remain as hygienic as possible. Lipsticks last anywhere from 1 to 2 years. Discard them should their fragrance change or they become difficult and patchy to apply. Lipsticks tend to get a distinct unsavory odor when they expire. As said earlier, lip liner can last anywhere from 1 to 2 years. If washed regularly, Beautyblenders can last up to 3 months. Most wedge makeup sponges are good for a couple of uses and should be discarded afterwards. Brushes need cleaning at the very least every week. Brushes respond well when cleansed using mild baby shampoo or bar soap. Non metal nail files should be discarded after 2 or 3 months. Nail polish has a long shelf life of up to 2 years or more. Always check that the polish consistency remains smooth and not clumpy. Should this happen; give it the heave-ho! I really like to be super cautious about cleansing false lashes between use. I regularly deep clean lashes by letting them soak first in micellar water and then submerge them in saline solution for a half hour and then let them air dry. This pseudo sterilization procedure also has the added benefit of keeping my lashes looking fresh and lush. Until next time my Blossoming Beauties. Always Remember That You Are Gorgeous and Rock Your Beauty! Marla Overland BSW, PSW is a Professional Social Worker in practice for over 30 years in the Public Health Care system and privately. Marla has also been a long-standing, avid follower of makeup and beauty trends and enjoys to share her suggestions and beauty world scoops with friends and readers of her online blog.